In just about any other era, Brad Park would have been considered the best defenseman of his generation. He had size and played aggressively, taking care of business in his own zone. Offensively, he was a pinpoint passer and a deceptive stickhandler, abilities which made him a natural and potent power-play threat. He had the skating speed and the instincts to join the rush, providing his team with a fourth attacker. But Park played at the same time as Bobby Orr, the greatest blueliner of any era, and later in his career his stellar achievements were second to Denis Potvin's dominating play with the powerhouse New York Islanders. Park was the runner-up six times for the Norris Trophy as the NHL's best defender and earned a berth on the league's All-Star Team seven times. He was an easy choice for induction into the Hockey Hall of Fame in 1988. He wasn't very physically strong in his teenage years and, unlike Orr, who was touted as a star from an early age, Park would sneak up on the hockey world rather than define it. One of his schools, the Catholic Neil McNeil high school, furnished the Toronto Marlboros of the Ontario Hockey Association with many of its young prospects. In 1965 Park and all but three of his teammates were invited to the Marlboros' training camp. Still physically small, Park escaped the notice of the Toronto coaching staff. He was preparing to play in the Junior B ranks when the Detroit Red Wings invited him to a junior camp. The Toronto Maple Leafs organization, which ran the Marlboros, got word of the invitation and put Park on its protected list. 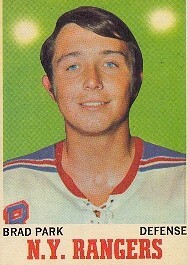 He joined the Marlies for most of the 1965-66 season. Park gained weight, putting just under 200 pounds on his 6' frame, and his skating and puckhandling developed to the point that in the summer of 1966, just before the NHL Amateur Draft, he was considered a sure bet for the professional leagues. Park and his family were more modest and he expressed hopes of ending up with the Maple Leafs. Instead, he was chosen second overall by the New York Rangers. Park stayed with the Marlies for two more seasons, becoming an outstanding defenseman and making the league's All-Star Team in 1968. At his first training camp with New York, he was shy and reluctant to mix openly with the more experienced Rangers. He was assigned to the Buffalo Bisons of the American Hockey League, where he played 17 games before returning to the NHL to stay. He scored his first goal in a game against the Boston Bruins, though it meant little as New York was already leading 8-0. Park, with his characteristic dry humor, called his first goal the game's "clincher." After a solid rookie season, Park established himself as one of the top defensemen in the league in his second year. He earned the respect of his teammates and the fans in New York, and soon the whole league was talking about his savvy and poised play. Park was named to the NHL's First All-Star Team alongside Orr and placed second to the Bruins star in voting for the Norris Trophy. He was the youngest Ranger ever to earn a place on the league's first team. Park's offensive numbers improved in each of his first four years with the Rangers. He was chosen to play for Canada in the Summit Series in 1972 and was impressive on the blue line for the embattled Canadians, finishing with five points in eight games. For the next several seasons, Park, whose Rangers had redeveloped into one of the league's better teams, was regularly compared to Orr, who was struggling with knee problems but still revolutionizing the position with his outstanding play. Park was an expert at taking forwards out of the play and away from the middle of the rink. Opponents would feel as though they'd beaten the defender to open ice, only to find they no longer had a good view of the net. Though Park had knee problems of his own, many hockey people predicted his career would stretch further than Orr's. That prediction would come true. Due to his poor knees, Orr missed 10 games in the 1975-76 season. He would play only a few more over the next three years before leaving the game. The man the Bruins brought in to replace him was Park, the result of one of the biggest trades in NHL history. On November 7, 1975, Phil Esposito and Carol Vadnais were sent to the Rangers for Joe Zanussi, Jean Ratelle and Park, who left New York as the team's all-time leading scorer for defensemen. In Boston, Park was a natural fit, his offensive skills meshing perfectly with the team's style of play. He enjoyed some his finest individual seasons with the Bruins and brought the club to the Stanley Cup finals in two consecutive seasons, 1977 and 1978, though the team failed to capture the title either time. 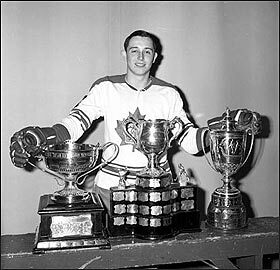 Twice Park was second in the voting for the Norris Trophy while he played in Boston, beaten out both times by the emerging Denis Potvin of the Islanders. In 1983 Park signed as a free agent with the Detroit Red Wings. He spent two seasons with the Wings, and though he had slowed a step, he proved he still had a unique sense of the game and the passing skills to take advantage of the openings he saw - he collected 53 assists in 1983-84. He retired from play following the 1984-85 season and coached the lowly Wings for half of the next season, winning only nine of 45 games before stepping aside.